The motto of Theta Chi is to "Extend a Helping Hand." This can be from the smallest favor to a brother, to the large philanthropic donations we make as a chapter to charitable organizations. A member of Theta Chi must always strive to provide what he can to those around him, establishing a better world for himself and those he cares for. Founded on the principle of friendship through the mutual assistance of every member, Theta Chi aims to provide its members with an enjoyable and fulfilling collegiate experience that also prepares them for rewarding, successful lives after graduation. Potential New Members are required to have a 2.7 cumulative GPA. All members are expected to maintain a 2.7 GPA or better. Each member must also complete 10 hours of community service per term. Participation in things like clubs and IM sports is highly encouraged. Any Potential New Member must be an enrolled student at Oregon State and is expected to attend classes here. 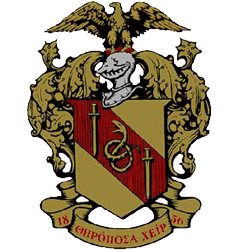 Founded in 1856, more than 175,000 members have enjoyed the Fraternity’s traditions, ideals and fellowship. Our collegians are leaders on campus, in the classroom and on the field. As men of Theta Chi, we consistently strive to become Resolute Men. Theta Chi is an international fraternity that is now 150 years old, and one of the oldest fraternal organizations in America. Theta Chi at Oregon State has stood for a century. Sigma Chapter has never been removed from campus, and it has stayed in the same house, built specifically for the chapter, since its construction in 1926. For ten years before that, the Chapter house was the same building that now houses the Downward Dog on Monroe. Theta Chi is the second oldest fraternity on campus. Here at Oregon State, we put on two philanthropies per year. $302,937.68.68 for the USO, with 41,371 man hours in volunteer service. Originally founded in a military setting, Theta Chi strives to support our soldiers, veterans, and their families by donating yearly to the United Service Organization (USO), an organization that provides goods and services to those veterans, troops and their families that are in need. We take this very seriously as without their incredible sacrifices, we would not have the opportunity to be part of a collegiate experience like this.